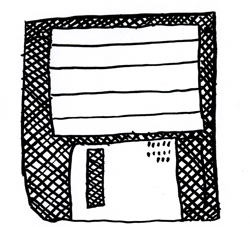 floppy disk drawing by ezara hoffman. thanks, ezara! of course, it is minimal. it is also experimental. our two biggest influences in this new medium ("playwriting") are ubercoolische and bertolt brecht. OSLO carries a fishing rod and a snare drum. MUSIK KRAUSE tiny, lives inside a saxophone (but inside the saxophone everything else is tiny; it's like a little saxophone world in there). MURMUR RECORDS playing the aforementioned saxophone, but percussively. BURIAL MIX sitting in the corner with a sampler & delay pedal. laser dreadlocks. curtain opens. PERLON stands on the hood of a muscle car, face distorted with laughter. PERLON: communication; what's up with that? curtain opens, quickly and happily. curtain closes, slowly and sadly. video of curtain opening projected on curtain. PERLON manually pulls open physical curtain. curtain closes, then another curtain closes in front of it. pause. another curtain can be heard closing backstage. as the curtain draws open, PERLON sleeps in a chair in the audience. no one else is in the theatre. curtain closes suddenly after four or five minutes of silence. hours later, the curtain slowly begins to open. at the stage manager's discretion, the curtain stops opening. OSLO is digging a hole in the middle of the stage. OSLO: You've chosen one of the most difficult 'speeches' in twentieth century Drama. Not only is it extremely difficult to 'understand', but its delivery is a major obstacle for even the most accomplished performer. You also need the other three characters, otherwise the speech doesn't work. I hate to sound so negative but you really should consider something more accessible for yourself and for your audience. OSLO: from the audience, yelling Wait! The shipment has arrived! MUSIK KRAUSE: from the audience, yelling The shipment was never meant to arrive! MURMUR RECORDS: from the audience, whispering Must we work? BURIAL MIX: We must. Spiders.